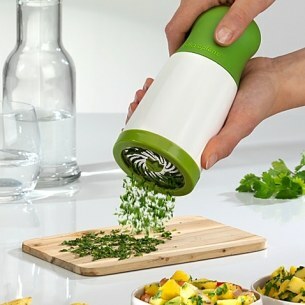 Microplane's Herb Mill features etched Microplane blades which tackle the tasks of cutting fresh herbs without bruising or blemishing. A simple twist of the wrist is all it takes to activate the super sharp cutting edges, which act as hundreds of tiny scissors. 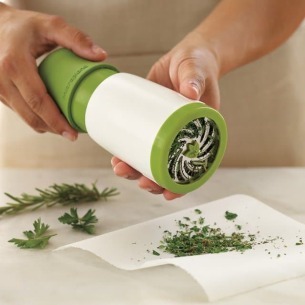 Removable handle to easily load a generous supply of fresh herbs. Microplane's superior technology yields consistently professional results with the ultimate in ease and convenience.